Jeff Lynne (born December 30, 1947) in Birmingham, UK, is a British singer-songwriter and record producer. 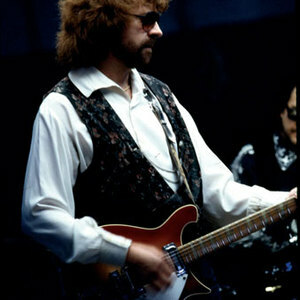 He was the co-founder (with Roy Wood and Bev Bevan), guitarist, and lead singer of The Electric Light Orchestra (ELO) in the 1970s and 1980s, as well as a co-founder of the Traveling Wilburys (with Bob Dylan, George Harrison, Tom Petty, and Roy Orbison) in the late 1980s. Prior to The Electric Light Orchestra, Lynne was a member of Idle Race and, along with Wood and Bevan, The Move. After ELO's breakup in the mid 1980s, Lynne moved into production work, showing both the influence of The Beatles that characterized much of ELO's work and an influence from rockabilly-style music. The Beatles' connection was strengthened when Lynne produced George Harrison's Cloud Nine, a successful comeback album for the ex-Beatle released in 1987 featuring the popular single "(Got My Mind) Set On You." In 1989, Lynne co-produced the acclaimed album Full Moon Fever by Tom Petty, which included the hit singles "Free Fallin'," "I Won't Back Down" and "Runnin' Down A Dream," all co-written by Lynne. This album and Traveling Wilburys Vol. 1, also co-produced by Lynne, both received nominations for the Grammy as Best Album Of The Year in 1989. In 1990 Lynne released his first solo album Armchair Theatre, featuring the singles "Every Little Thing" and "Lift Me Up." The album received some positive critical attention but little commercial success. In February of 1994, Lynne fulfilled a lifelong dream by working with the three surviving Beatles on Anthology album series, and reunion tracks "Free as a Bird" and "Real Love" (overdubbing John Lennon's demos for the songs). He has also produced records individually for George Harrison, Paul McCartney and Ringo Starr, and worked extensively on the Roy Orbison album Mystery Girl. In 2001, Lynne released a new ELO album, Zoom, which--save for original ELO keyboardist Richard Tandy on one track--featured none of the original members of the Electric Light Orchestra, but attempted to "return to the classic ELO sound" . The album received positive reviews but had no hit singles. While a concert of the album was filmed and shown on PBS stations, a planned concert tour was cancelled, although the concert was released on DVD. Also that year, Lynne appeared on a VH-1 Storytellers show filmed in New York, and EMI and Sony released remastered editions of part of ELO's catalog. Lynne went back to the recording studio as a producer in 2002, co-producing and helping complete George Harrison's posthumously-released album, Brainwashed. He was also heavily involved in the memorial Concert for George, held at London's Royal Albert Hall in November 2002, and subsequently produced the Surround Sound audio mix for the Concert For George DVD released in November 2003. The DVD received a Grammy for Best Long Form Music Video. Also in 2002, a tribute to Lynne called Lynne Me Your Ears was released , featuring two CDs full of artists performing Lynne/ELO songs, including Todd Rundgren, SWAG (featuring members of Wilco, The Mavericks and Cheap Trick), Sixpence None The Richer, Doug Powell, PFR, Jason Falkner, Fleming and John, Jerry Chamberlain of Daniel Amos, Rick Altizer and others. In an interview with Rolling Stone magazine Tom Petty revealed that fellow Wilbury and Full Moon Fever producer Jeff Lynne will reunite with Petty on his upcoming solo album, due in 2006.